One of only 12 UNESCO Natural World Heritage sites in Australia, Purnululu National Park covers almost 240,000 hectares of remote wilderness and includes the Bungle Bungle Range, a spectacular landscape of sculptured rocks and sandstone towers. Your local guide will take you back to a time where the Aboriginal people lived here for some 40,000 years. Learn about bush-tucker, Aboriginal customs and the many reasons why Purnululu is World Heritage listed. Immerse yourself in the spirit of this ancient place. Bungle Bungle Guided Tours is an Accredited Tourism Business and offers a unique experience, providing guided walking tours with an Aboriginal perspective of the World Heritage listed Purnululu National Park. Locally owned, we aim to employ local Aboriginal guides who share their culture with visitors whilst on tour. We provide sunblock, refreshments and meals (as noted) and water to refill water bottles. With exquisite starry skies above – why not stay the night at the Bungle Bungle Savannah Lodge? Situated at the southern end of Purnululu in Savannah grassland, the lodge has a freshwater swimming pool and an open air dining deck as well as indoor dining room. Accommodation in a spacious private ensuite cabin with 3 course dinner and cooked breakfast is from $297pp. Departure in the morning is at 7am or 10am. 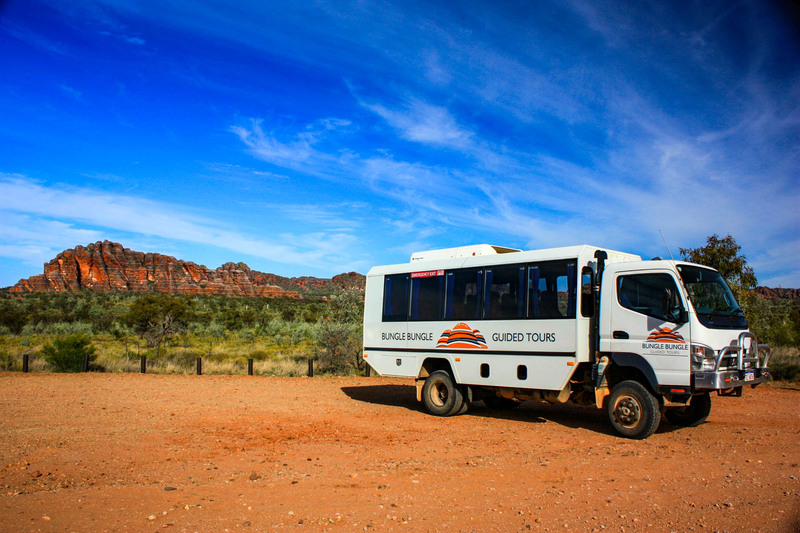 Tours start from Bellburn airstrip, Purnululu National Park. The park is 4WD access only and Bellburn is 76 km from the Great Northern highway. The access road is Spring Creek Track which meanders through Mabel Downs Cattle Station, through hills and over creek-beds. It is a pretty drive that takes between 2 to 3 hours depending on the current conditions. You can fly in to join our tours from most Kimberley towns with a scenic flight transfer by plane or helicopter. 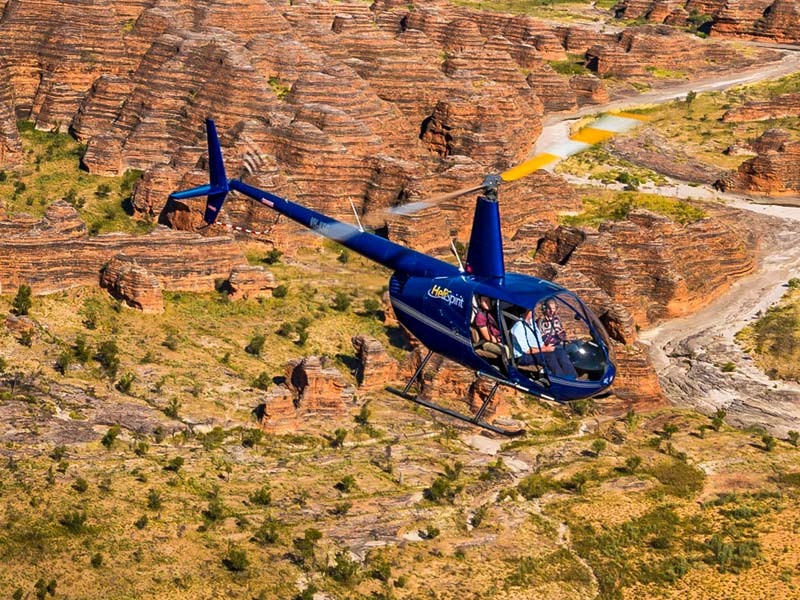 Scenic flights over the Kimberley are spectacular and show the hidden secrets you just don’t see from the ground. Choose from a helicopter departing from Warmun or Kununurra or an aeroplane departing from Kununurra, El Questro or Broome.